Five local governments have launched an interagency regional recruitment drive for citizens interested in becoming firefighters with their area fire departments. The partners in this first-of-its kind regional recruitment drive include the Las Vegas Fire and Rescue Department, Clark County’s Fire Department, and the North Las Vegas, Henderson and Boulder City fire departments. Job seekers interested in a fire service career with one of the participating agencies can visit www.snvfirerecruitment.com to learn more about the recruitment effort and apply for jobs. Applications will be accepted online only through thewww.snvfirerecruitment.com website beginning Monday, Oct. 27, through Wednesday, Nov. 26. The city of Las Vegas is hosting the website and will forward applications to partnering agencies. Candidates who successfully complete the application and testing process will be forwarded to fire departments for consideration as openings occur within their departments for the next year. In addition, a series of outreach sessions will be held to help interested applicants learn about the different fire departments and address important dates for the recruitment effort, the application process, employment requirements, the testing process, test-taking tips and available positions. The joint recruitment saves local governments the cost of doing independent recruitment efforts and is more efficient for candidates because they can apply with more than one agency from the same application. •Monday, Aug. 25, 1-3 p.m., Clark County Government Center Commission Chambers at 500 S. Grand Central Pkwy. in downtown Las Vegas. The session will be recorded for playback and viewing on the www.snvfirerecruitment.com website. The session also can be viewed live as it occurs on the agenda page of Clark County’s website at www.ClarkCountyNV.gov. •Wednesday, Sept. 17, 1-3 p.m., College of Southern Nevada Cheyenne campus auditorium at 3200 East Cheyenne Ave., North Las Vegas. •Tuesday, Oct. 14, 6-8 p.m., North Las Vegas City Hall, 2250 N. Las Vegas Blvd. •Thursday, Aug. 28, 1-3 p.m, Las Vegas City Hall Council Chambers, 495 S. Main St.
•Friday, Sept. 5, 2-4 p.m., Desert Breeze Recreation Center, 8275 W Spring Road. •Thursday, Sept. 18, 9-11 a.m., Las Vegas City Hall Council Chambers, 495 S. Main St.
•Wednesday, Oct. 1, 2-4 p.m., Hollywood Recreation Center, 1650 S. Hollywood Blvd. •Wednesday, Oct. 8, 6-8 p.m., Las Vegas City Hall Council Chambers, 495 S. Main St.
•Friday, Oct. 17, 2:30-4:30 p.m., West Flamingo Senior Center, 6255 W. Flamingo Road. •Wednesday, Oct 29, 2-4 p.m., Sunset Park Office Conference Room, 2601 E Sunset Rd. •Wednesday, Nov. 7, 2-4 p.m., Mountain Crest Park Center, 4701 N. Durango. •Wednesday, Nov. 12, 2-4 p.m., Robert Bob Price Community Center, 2050 Bonnie Lane. 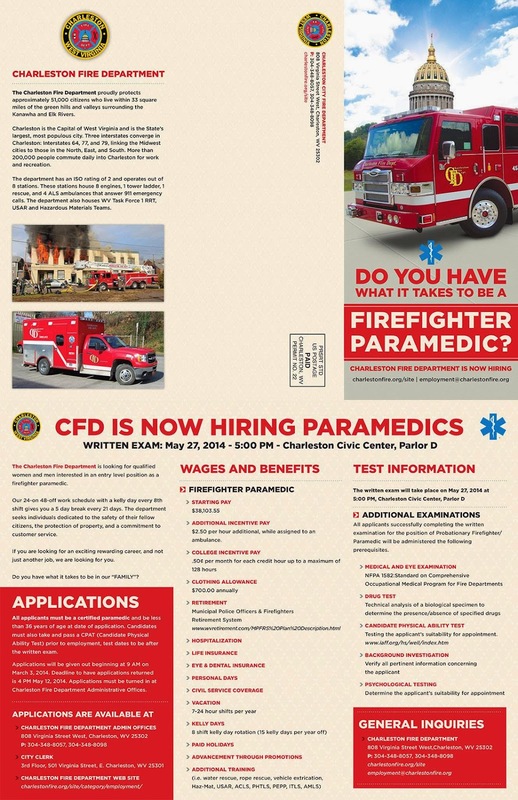 The City of Charleston, WV is giving a test for firefighter/paramedics. Successful completion of the Candidate Physical Ability Test(CPAT) is MANDATORY to advance in almost every fire department's hiring process after application submission and written test. Do not pass go do not collect $200. CPAT certificates are valid for (1) year after issue date. We accept external agency's CPAT certificates pending validation. What happens when a reporter takes the Candidate Physical Ability Test? With very little training she made a strong go of the CPAT, but the endurance required quickly took its' toll! Click here for CPAT License Information. Prince George's County Fire Department Hiring! Prince George’s County Government is an Equal Employment Opportunity Employer. To view information specific for employment with the County Police Department please view their careers page to JOIN PGPD. As of July 1, 2011, applications will only be accepted online! Now you can view current job openings and apply on-line using our On-line Job Application! The system is user-friendly and you can apply for jobs 24/7. Your application can be saved and used to apply for more than one job opening. An email address is necessary to apply on-line. If you do not have a current email address, you can sign up for free email at Hotmail, Yahoo or Gmail! Please click to review our Privacy or Security Statements. If you are a first time user, please take advantage of our helpful On-line Application User's Guide (PDF format). If this is the first time you are accessing the Prince George's County Government's on-line application system, you will need to create an account and select a username and password. To do so, click on the Create Your Account Here link and complete the form. You will then be able to log in to your account. After your account has been established, you can create an application by logging in and clicking on the Build Job Application link. As you complete your application, remember to save work in progress. If you have been in the system for more than an hour without saving your entries, you will be automatically logged out as a security measure, and your information will be lost. Once your application is completed, it will be stored in the system and can be used to apply for future job openings. Please provide a complete history of your work experience. At the bottom of this page are current employment opportunities. Click on the job title you are interested in, and then click on the “Apply” link. Some positions require a job specific supplemental questionnaire. If the job bulletin states that a job specific supplemental questionnaire is required, the questions will appear near the end of the on-line application process. You must submit an application in order to be considered for each job opening. You will have an opportunity to copy and paste your resume into the application, but resumes alone are not accepted. Please remember to logout of the system before you leave this site. View Job Openings and Apply! To check the status of your application click here. 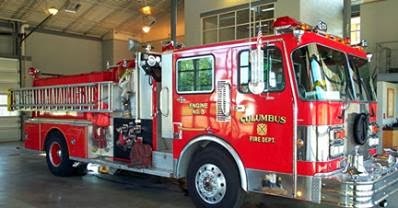 The City of Columbus Fire Department is seeking firefighters looking for a career in the Fire Service. Every day City of Columbus Firefighters affect the lives of those we are sworn to serve by providing medical assistance, rescuing vehicle accident victims, fighting structure fires, or providing fire safety and education information to our cities and communities. The road to becoming a firefighter is a long and arduous one. The City of Columbus Fire Department's hiring process is conducted biennially (every two years) on the even numbered year.